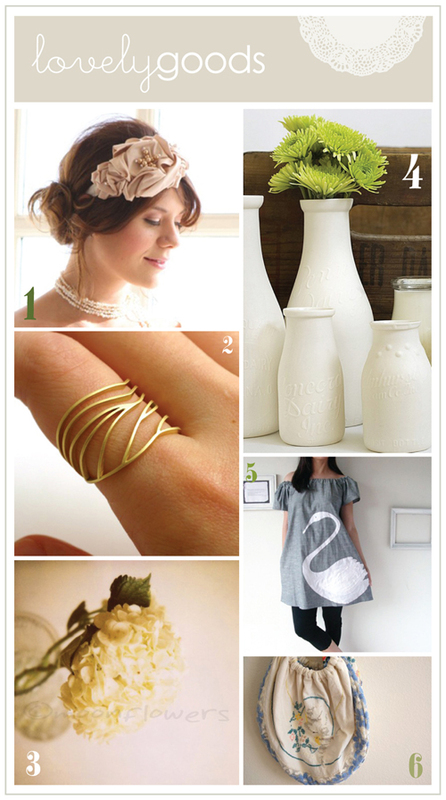 That appliqued swan dress is great inspiration. And all the other dresses in ZoeChen's shop are pretty wonderful. Love love that hair pieces and that vintage tablecloth bag is genius! BTW: I am doing a giveaway on my Lovely Clusters blog and we are giving away a cami dress from Plum Pretty Sugar. :) Have a lovely day! i was totally eyeing that dragonfly ring the other day! thanks for including my bag! You've done it again with your gorgeous finds. I love that headband and the dress. And those bottles are great too! Oh, today i first time found Your blog, it is really amazing! and i love that ring, unique form.. and the bottles, i wish i could have in my bathroom! this photograph is gorgeous! I stopped by moonflowers' shop and I fell in love :) thanks for sharing! Wow! that ring is really out for the ordinary, simple but still gorgeous! I love those porcelain bottles - they're beautiful! Thanks for sharing..
What a lovely collection this is , I want them all ! i'm swooning over ALL of it! love love love your blog!! I truly admire Alissa's work. I remember reading about her and thinking she does some very cool things. The dragonfly wing ring too! Such a novel idea. got so much traffic from you to my etsy store I had to come check out your blog, thanks for posting my headband, you have a great blog, and I am honored to be featured.